The 2017 Cadillac CT6 came equipped with eye-tracking technology, which alerts the driver when their eyes stray from the road in front of them. In an age where cell phones are ever-present and attention spans have all but evaporated, driving has become an increasingly dangerous activity. Our accident record is bad—and getting worse. But auto giant General Motors (GM) has their eye on the trend, and the company is hoping to do something about it. The automaker has developed eye-tracking technology, which it introduced in its 2017 Cadillac CT6. Meant to curb distracted driving—and the deadly accidents caused by it—the system is able to tell exactly when a driver has stopped paying attention to the road by keeping tabs on where his or her gaze is focused. While GM has kept mum on details about how the technology works, the company said the program will set off visual and audio alerts once it detects that a driver’s eyes have wandered away from the street. If a correction isn’t made, the company’s OnStar service will reach out to the driver, and, if that also proves unsuccessful, the car will automatically pull over and stop. While the program can only be activated during highway driving, it’s just one of the latest systems developed by carmakers to control human behavior behind the wheel. Aside from GM, Toyota and Audi are also reportedly introducing or working on eye-tracking technology. 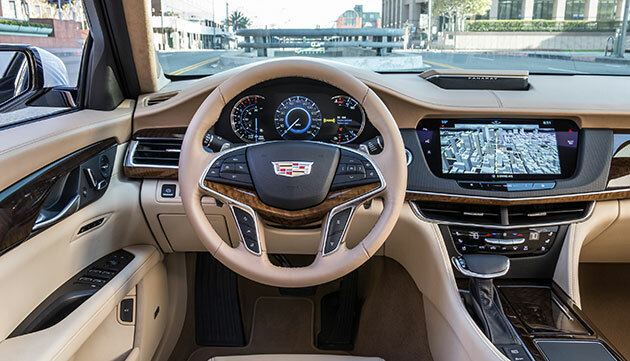 And the CT6, as well as a number of other models from across the automotive industry, are also fitted with sensors in the steering wheel that detect when a driver removes his or her hands, sounding an alarm when they’ve been gone for too long. The rise of such new safety systems comes at a time when our cars are arguably as dangerous as ever. Automated technology is coming—fast. But we’re currently at an awkward in-between phase, where our cars are still learning how to drive. But regardless of that restricted ability, the idea that such models include a “self-driving” mode has given many drivers a false sense of security, causing them to relax behind the wheel, even in situations where their attention is still needed. By adding sensors to give the machine a sense for the flesh-and-blood driver’s sight and touch, GM is hoping those dangers can be mitigated. Let’s just hope they keep their eye on the ball.